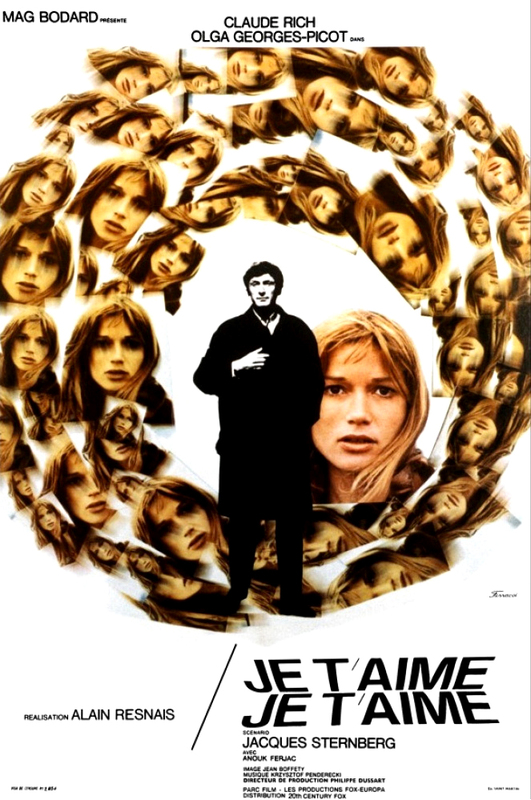 In tribute to the great French auteur, for three nights only Northwest Film Forum will host his rarely seen (and singular, in every sense) science fiction exercise of 1968, "Je T'aime, Je T'aime". This past year saw the passing of one of the great incongruities in the French New Wave, it's technician of time and space, Alain Resnais. A director who unlike most caught up in the tumult of the zeitgeist never did away with the more refined elements of perfection in crafted cinematography, exacting editing, gorgeous environments and professional actors, but instead chose to make his revolutionary mark elsewhere. Taken together, Peter Harcourt's "Alain Resnais: Memory is Kept Alive With Dreams” for Film Comment along with the New York Times' "Alain Resnais, Acclaimed Filmmaker Who Defied Conventions, Dies at 91" and David Thompson's obituary in the pages of Sight & Sound, "Alain Resnais: The Most Unpredictable of the French New Wave Directors Mixed High Intellectualism and Irreverence" make for an ideal introduction to the man and his art. Resnais, most of us know for his groundbreaking post-War drama, "Hiroshima, Mon Amour" wherein the protagonist's hope and guilt are written large in the landscape of the Japanese aftermath. Their romance caught up in the larger global concerns, the anguish of past, present, and future; the need to understand exactly who and where we are in time. Kent Jones' "Hiroshima Mon Amour: Time Indefinite" for Criterion supports Eric Rohmer's claim from a July 1959 Cahiers du Cinéma panel, stating that "Hiroshima Mon Amour" would come to be seen as "the most important film since the war, the first modern film of sound cinema.” It is this great work alongside what's considered the centerpiece of his career, "Last Year at Marienbad" that define Resnais' position in the canon of post-War film. Of all of Renais' filmography, Marienbad foregrounds place in a self-reflecting prism that counterpoints image with sound, past with present, and stasis with movement to set up an induced tension between our responsibility to remember and the impossibility of doing so within such a narrative construct. The marvels and complexity of this 1961 dream-labyrinth of a film, deciphered in Mark Polizzotti's "Last Year at Marienbad: Which Year at Where? ", for Criterion.